This was a big weekend for Childish Gambino, the musical alter ego of Atlanta star and creator Donald Glover. 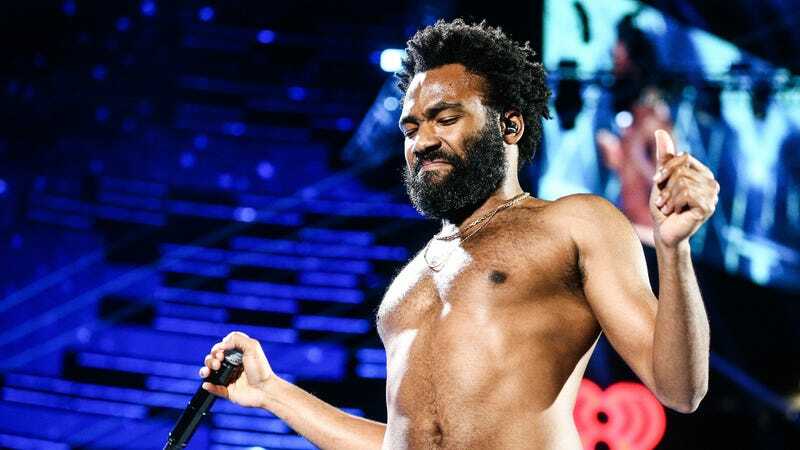 Not only was Glover debuting a brand new 55-minute Amazon movie, Guava Island—including new visuals for his shock-to-the-system 2018 hit, “This Is America”—but he was also holding down his first headlining set at Coachella, a.k.a. “That place where Beyoncé blew everybody’s minds the hell away last year.” So, yeah, no pressure. Glover responded to all this potential crisis/opportunity by leaning into his strengths, leveraging his personality and talents as a visual artist to take the festival’s massive crowds to “church”—and then maybe also to the alley behind the church, given that he hopped into the crowd at one point to take a smoke break with a lucky fan. Videos of Gambino’s late-night Indio performance also show him parading up and down the stage, delivering a somber, realist monologue on the deaths of his father and community figures like Mac Miller and Nipsey Hussle, sharing a quick backstage hug with Janelle Monáe (who had her own kickass set last night, we should probably point out), and even, occasionally, performing some actual songs.